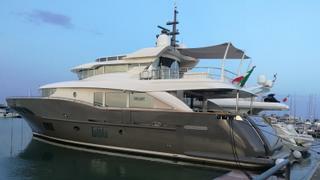 Italian yard Filippetti Yachts has launched Maxima, the second hull in its Navetta 26 series. 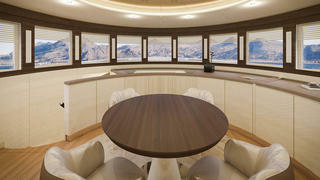 Styled inside and out by Milan-based design studio Hot Lab, her naval architecture is by Pietro Mingarelli. Key features include large glass windows that have been double glazed and thermally insulated to suit the owner’s cruising plans in the northern seas. Custom features on this model include a new skylounge and raised wheelhouse set up that replaces the flybridge fitted to the first Navetta 26, Sakata — which hit the water in 2011. The yard adds that this option will now be offered on all future models. The forward section of the main deck will be reserved for dining, offering spectacular 180-degree views out to sea during meals. The on board décor strikes a fine balance between classical and modern styles, with leather, marble and neutral fabric tones contrasting with American walnut woodwork. All of the accommodation is situated below decks with room for four guests, split between a master suite measuring 25 square metres and a VIP guest cabin. Filippetti explains that the owner chose to prioritise space over the sheer quantity of cabins, with the owner’s en-suite taking over the area normally reserved for the second guest cabin. 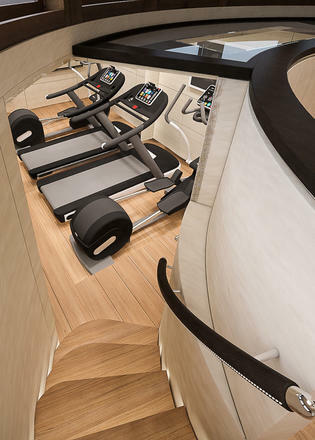 A private superyacht gym in the bow completes the lower deck layout. 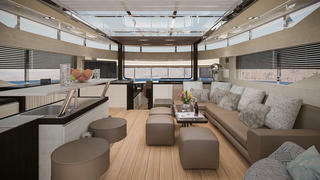 A crew cabin will be fitted back aft, but since the owner plans to cruise without any crew, this version of the Filippetti Navetta 26 will feature four remote helm stations — two fore and two aft of the main deck — all of which will allow full control of the yacht’s systems. Additional insulation will be fitted to reduce noise and vibration levels underway and ensure maximum comfort during overnight passages, while the Kabolia oil boiler system will feature remote mobile control to allow the owner to preheat the boat prior to arrival. All of this combines with a cruising range of 3,000 nautical miles to make lengthy expeditions possible. Power will come from a pair of 730hp MAN R6 engines, while a pair of AB Track fins and a Seakeeper stabilisation system will ensure a comfortable cruising experience.